Twin Casino will then reward you with a bonus (Welcome Bonus is for new players only). The terms and conditions of the bonuses vary between different casinos and might also change over time and between different countries, so it is important to compare the different offers and read the T&C for Twin Casino before signing up. 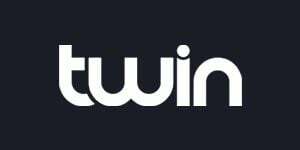 Twin Casino is a well-rounded online casino with a positive energy all about it, offered in English, German, Swedish, Norwegian and Finnish. Owned by Oring Ltd. Casinos, Twin Casino is a charming and elegant online casino holding two licenses, issued by Malta Gaming Authority and the government of Curacao. Its design, other than being appealing to the eye, is also mobile-friendly and easily navigated regardless of what device you are accessing it from, due to it smart and well thought through organisation. Moreover, everything you might need from an online casino is just a click away, and the dropping and side menus really help with finding your way around this casino, even when you are visiting it for the first time. Encrypted by the state-of-the-art encryption makes you private details safe and sound, while regular audits vouchsafe the games’ fairness. If you are looking for an online casino that hosts all of the well-known classics, as well as the freshest additions to globally acclaimed suppliers’ portfolios, you are just where you need to be! Supported by the powerhouses with the likes of Microgaming, Evolution Gaming, NetEnt, Play’n GO, Quickfire, Yggdrasil Gaming and many others, Twin Casino can proudly say that it has everything you need. Do not fret if the casino’s youth makes you question your choice. 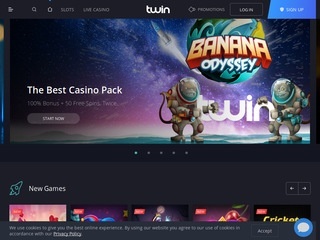 Although launched just about a year ago, Twin Casino has just as much to offer as any other eminent online casino that has been around much longer. Take our word for that. Just as one might expect, Twin Casino’s offering is dominated by the most popular online casino game – slots. This online gambling venue possesses over 400 phenomenal slots, diverse in genres, gameplay, rules and number of reels, so all of you will have something to look forward to. The newest games are always added at the beginning of the slot lobby, and currently they include Astro Pug, Street Magic, Jaguar Temple, Da Vinci’s Treasure, Hanzo’s Dojo and Jammin’ Jars. Being so new in the business sometimes means not having a vast variety of games to offer. Not with Twin Casino! This online gambling destination offers a mass of popular table games including Baccarat, Blackjack and Roulette, not leaving out manifold of their modern variants. Video poker lovers can play all of their favourites titles like Deuces Wild, Joker Poker, Jacks or Better and a whole bunch of other ultra rewarding, incredibly engrossing titles! Now this is live gambling! Twin Casino offers a mind-blowing repertoire of live games for all of you who like a human touch to your online gambling. A real dealer will deal for you in real time and around the clock, so all you need to do is make a choice. This might be hard – there is just so much to choose from. Twin Casino’s live game offering encompasses dozens of Roulette variants such as London Roulette, Double Ball Roulette, Dragonara Roulette and Speed Roulette. There is certainly no shortage of Blackjack and Baccarat editions, as well as Dream Catcher, Poker and Craps. Along with its Twin Affiliates Programme, Twin Casino offers a time-saving and quick banking experience. Allowing you to use a number of currencies (British pounds sterling, Euros, American dollars, Canadian dollar, Australian dollars, Swedish kronor and Norwegian kroner), and dealing with requests incredibly fast, Twin Casino boasts one of the most carefree banking service out there. Deposit an withdrawal methods include ewallets, credit and debit cards and even bank wire transfer. With a magnificent time frame of 0 to 2 hours ewallets, Twin Casino lets its actions speak louder than words. A cherry on top are its withdrawal limits – you can get paid out a fantastic 50,000 each week! There can always be a time when, however well-equipped and easily navigated an online casino is, we find ourselves in a pickle. In such cases, it is crucial for it to have a responsible and efficient customer service team. Luckily Twin’s customer support is available 24/7, the Live Chat feature is enabled directly from the homepage, so just click on the icon in the lower right-hand corner of your screen and a pop-up chat window will appear. Here you can type in your email and the team’s representatives will get back to you in an instant. Twin Casino boasts a 30-second response time. As you scroll down to the bottom of the page you will find a ‘Get in Touch’ button by clicking on which you will be presented with all ways you can reach Twin Casino’s agents. There is an enquiry form that you can fill out there and then, or you can use your email provider to send them your question to [email protected] Lastly, there is a lengthy FAQ list, if that is more up your street.